Understanding the dynamics of free surface flows is the starting point of many environmental studies, impact studies, and waterworks design. Typical applications, once the flows are known, are water quality, dam impact and safety, pollutant control, and sediment transport. These studies used to be done in the past with scale models, but these are now being replaced by numerical simulation performed by software suites called “hydro-informatic systems”. The Telemac system is the leading software package worldwide, and has been developed by Electricité de France and Jean-Michel Hervouet, who is the head and main developer of the Telemac project. Hydrodynamics of Free Surface Flows is essential reading for those involved in computational fluid dynamics and environmental impact assessments, as well as hydrologists, and bridge, coastal and dam engineers. 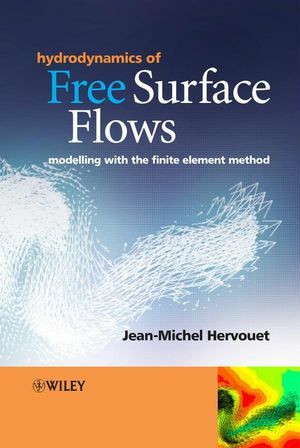 Guiding readers from fundamental theory to the more advanced topics in the application of the finite element method and the Telemac System, this book is a key reference for a broad audience of students, lecturers, researchers and consultants, right through to the community of users of hydro-informatics systems. Jean- Michel has spent his entire career with the Research & Development division of Electricité de France, in the field of Computational Fluid Dynamics. Since 1987 he has been the head of the Telemac development project, which is a 1 Million euro a year EDF-funded project dedicated to the numerical simulation of free surface flows, and more recently groundwater flows. The Telemac system is now one of the main hydro-informatic systems commercially available in the worlds). He is a member of the International Association of Hydraulic Research and the Société Hydrotechnique de France, participating in the scientific committees of international conferences (Coastal Engineering, International Conference on Hydro-science and Engineering, Modelling of Flood Propagation over initially dry areas, RiverFlow, etc.). As well as a referee in a number of scientific journals: Journal of Hydraulic Research, Hydrological Processes, Journal of Computational Physics he has also been co-editor with Professor Paul Bates of a special issue of Hydrological Processes on the Telemac system, and editor of a special issue of the “Revue Européenne des Eléments Finis” on the topic of Numerical Hydraulics. Chapter 2. Equations of free surface hydrodynamics. Chapter 3. Principles of the finite element method. Chapter 4. Resolution of the Saint-Venant equations. Chapter 5. Resolution of the Navier-Stokes equations. Chapter 6. Solving transport equations. Chapter 7. Modern techniques in finite elements. Appendix B. Diffusion matrix with tetrahedra.